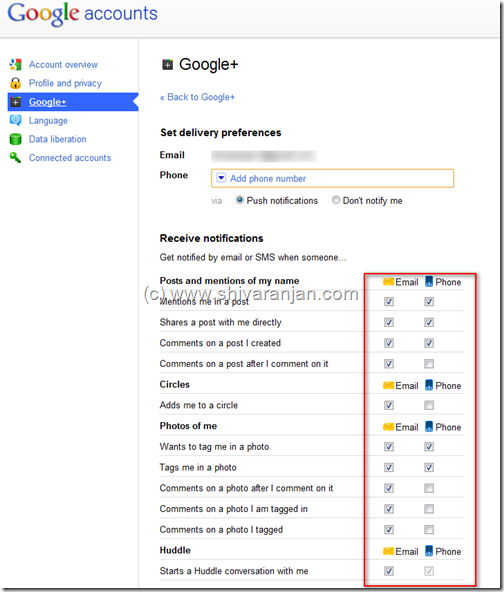 Home > Computers and Internet > Google+ Plus: How to Stop Email and SMS Notifications? Google+ Plus is awesome but one of the most annoying things, was that I was receiving many emails with regard to the Google+ notifications. There is an easy way using which you can configure the email notifications that get delivered or you can stop them altogether. 1. Login to your Google+ account and then towards the top right side of the screen click on the ‘gear’ like button. You will now see a dropdown menu and choose ‘Google+ settings’ there. 2. Now you will be taken to a page where you can choose the events for which you will receive notification in email and SMS. 3. Select the events for which you want to receive an email or SMS notification. In my case I disabled all the notifications as I don’t want any emails or SMS as I get notified by Google+ Android app. Do any of you prefer to receive Google+ notifications in SMS? I felt that until there is a way to post to Google+ via SMS there is not point in receiving notification via SMS. Previous post: Google Plus (+) : How to Delete a User Comment from your Stream/Post?